Recovery is not for the faint of heart. We are warriors; fighting a foe just as powerful as any combat soldier faces. Please do not take offense or umbrage at that if you are a veteran. I probably have more respect for the fragility of life, given that I know that my addiction strives to harm or even kill me just as much as any adversary you have faced on a battlefield. About 26 years ago, I was raking leaves at the recovery home I opened and ran. They were dried up, torn, and stuck together with the last remnants of snow. 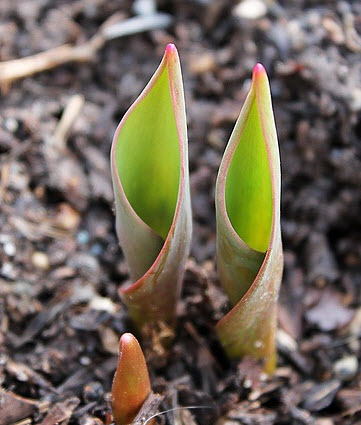 When I got down to bare earth, I saw a tiny green tulip shoot barely breaking the surface of the ground. It gave me pause. I do not take lightly when the Universe demonstrates a lesson for me. To blossom and show itself in all its splendor and beauty. Tulips and people do not blossom without a struggle. Imagine; buried under layers of dirt as an insignificant, shriveled bulb. Certainly there was potential for this to blossom and bloom, but conditions would have to be correct. There had to be enough water and sunlight for the small, slender shoot to break through the outer casing. Aren’t we like the tulip in our recovery as well? All people are born with the potential to be all that they can be. We each have talents, strengths, limitations, and weaknesses. I’m like a lot of other people. For years, I heard about my potential. From an early age, my father encouraged my small talents, but over time, as my addiction progressed, his comments about my potential seemed tinged with more sadness than encouragement. In the yard that day, I reflected on my addiction, the bulb stage of my development. Drugs and alcohol did not fuel me to grow, except for the character defects. I became a distorted version of all that I could be. Rather than a beautiful flower, I was an insidious blight; smothering the life out of all those I loved, and overtaking anyone and anything that stood in the way of getting and using drugs. In 1988, my employer staged an intervention. When I was summoned to the president’s office, I was not initially alarmed. However, when I walked in and saw three Deans and the president of the college, all holding 4 x 6 cards and looking embarrassed and uneasy, I knew exactly what they proposed to do to me. Each of them in turn was looking at the other, probably for guidance and moral support. In my case, they did not have to read the cards. I wouldn’t make a good candidate for any intervention shows since I caved at the sight of them all lined up, ready to do battle with my addiction. I also was not willing to listen to their collective examples of my misconduct, drunken exhibitions in classes, or other variations on my behaviors. Bailey’s Irish Crème in an overly large coffee cup apparently didn’t fool students. Within two minutes, I quietly said, “What do you want me to do”? Each of these people had risked a potential tirade, manipulation, and dishonesty when they decided to face me. Instead, they each audibly sighed and then gave me an ultimatum – get treatment or be terminated. Deciding that treatment was the better option, I entered that night. I would encourage anyone who is struggling with addiction, to ask about all the many methods, philosophies, and models for treatment today. Twenty-eight years ago, there were only limited options. My medical problems from my Xanax use and daily alcohol consumption meant that I needed a three-week detox, followed by three extra weeks in intense treatment. I realize that without a safe, locked facility and caring, nurturing counselors, I would have relapsed and never achieved all that I have. There is another interesting aspect to tulips. They reproduce other bulbs. In 1990, I was encouraged to open a women’s recovery facility. The tulips bloomed in the yard, and the women blossomed, also. The house closed in 2011, allowing me time to find the courage to write about the experiences of addiction and recovery; just another way to populate the world with the benefits and realities of recovery. I am grateful for the blog. I may only reach one person, but if these words let another see their potential, nourish it, and help them flourish, then I’ve been a good gardener. When you’re ready to spread the word that ‘recovery works’, consider a guest post.